Straits Quay is Penang’s first sea-fronting retail marina, complete with serviced residences, a performing arts centre and a convention centre. The architecture of Straits Quay draws its inspiration from the island’s grand colonial heritage, with wrought-iron filigree work reminiscent of the iconic Eastern & Oriental (E&O) Hotel. Wrought-iron work is a traditional trade of Penang, and there are many beautiful examples of wrought-iron gates, railings, balusters and other decorative ironwork on buildings around the island. Decorative wrought-iron work is known not only for its beauty, but also for its practicality. 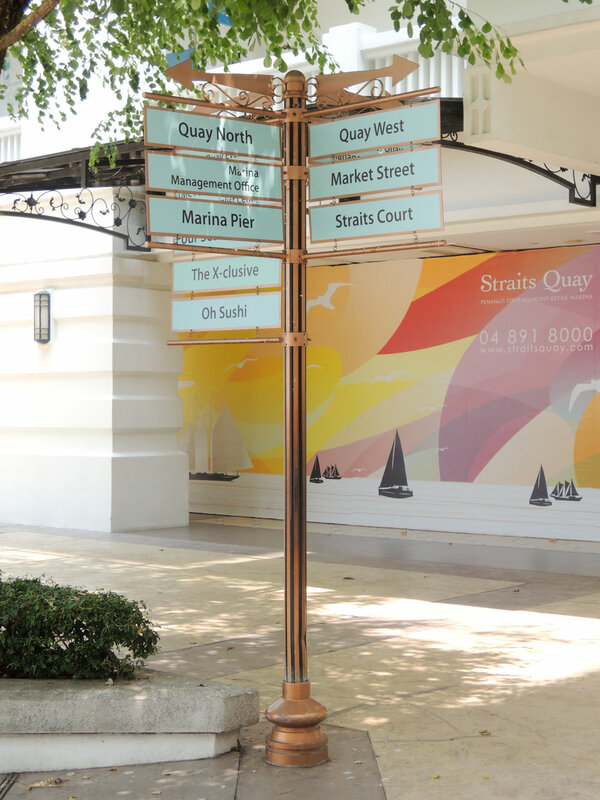 For Straits Quay, we designed the building sign at the main entrance with intricate open wrought-iron ornamentation as a solution to reduce weight and wind loads, and hung it high on a Victorian market-style roof structure. Computer simulation of illumination done in-house at WHW. Pictographs (icons) and signs with a 1920s—1950s bearing were custom designed for Straits Quay, drawing from the heritage of the nearby E&O Hotel whose history goes back in time to 1885, with its heyday in the 1920s; and again in the 1950s, after the Second World War. The graphic style of the pictographs range from 1920 to present day, where the old and the new co-exist harmoniously. Signs were designed with a subtle colour palette and classic forms in order to complement and to integrate with the elegant interior architecture. Festive buntings at the Marina Pier, however, take on a more colourful and vibrant character to echo the vivacity and energy of these spaces. Recently (March 2017), we returned to Straits Quay to work on the interpretive gallery of the E&O Visitor Centre (below), and were pleasantly surprised to discover some new directional poles which expanded on our original design intent.